I was recently sent an album for review, Sonic Sea by Anjroy. I didn't know what to make of it. Anjroy is a pop/rock/electronica band from here in Pittsburgh. The singer, Jocelyn Rent, was in the band Omega Love, a band that a guitar teacher I had, Luke Williams was in. That band had a similar sound to Anjroy. Neither of those bands are my type of musick, but I did finally listen to Sonic Sea. 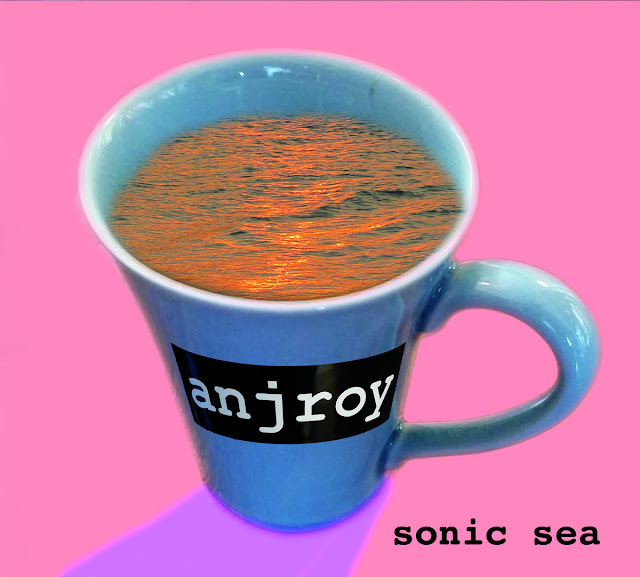 The album cover for Sonic Sea is not good. Okay, we have a blue-tinged coffee cup full of the titular water floating in a pink void. The title is in a sans-serif font, hugging the edge too closely on the bottom right, hurting the already hurting composition. There's not much to draw the viewer in. It's a strange cover for sure, but what should I take from this? Coffee is the lifeblood of middle-class mucisk? It's true; ads seem to back that up. This cover art looks too phony, too much of a computer manipulated veil over nothing. That isn't far off from the rest of the album. The tools are there but the vision isn't. Sonic Sea starts with "The Movement". I liked this track at first, but it didn't hold up for me throughout the song. I really like the keyboards, like Casiopea or some old-school anime musick. I don't like the drums; they seem too perfect, somewhat robotic. The second track, "Juice", is pretty good, coming straight in to fill the void. It has some nice energy to it and sounds more natural. Again, I really like the jazz-fusion keyboard parts. "Motion" also comes right in, keeping the album moving forward. "Motion" is a little more laid-back. I like the drums and the keyboard solo towards the end. "Marion" comes next. I don't like that all these tracks have somewhat vague and terse names, but this one is referenced in the song at least. "Marion" gets really high energy at the end with rising instrumental blares. Before that, I felt like it was kinda so-so. "High Dive", the fifth track, is the single. I really like the sort of breakdown in the middle, but the rest of the song is just alright. The singer has some impressive vocals on "High Dive", though for sure. "Cast Me Away" starts what would probably be the next side if this wasn't a CD. It's a more atmospheric song, and I like this one. It fades right into the seventh track, "Cloud Crusher". I like the synths at the start, the subtle background echoes, and the horns. I don't like the drums and the overall production. This sounds like a Björk track. It is her birthday today, so maybe this was all fate. "Cloud Crusher" has some interesting parts where the vocals are isolated and sound like they are coming through a radio, which adds drama and sounds neat. Now the next track, "As I Trace" doesn't really stand out for me that much. It pushes forward with some cool synths, however, I don't like the vocals. I should say that overall I dislike vocals like on this album. This track also seemed especially turned towards mids and highs. The bass was weird. "Fabrications" comes in with a new sound. It's more like "Cast Me Away", atmospheric and slower, without the dance drums. "Between Our Thoughts And Isolated Islands" goes back to the jazz fusion sound. I liked this one. This sound works best for these vocals. The production was less piercing too. Some UFOs land in the latter half of the song. I hope the band was okay. "Chasing Waves" is the last track, post-alien abduction. This one isn't anything special. It's fine. It's much more subdued than the rest of the album; sometimes it's best to not have all the bombast. "There's a moment in the emptiness". Sonic Sea was really a pain for me to listen to the first time. I initially felt much more negative about it, but I gave a few of the tracks another listen. Some of these are really good. Clearly, the musicians put a lot of work into this album. There are still problems, the work put into it being the main one: everything seems too clean and too bright, musically. The vocals and drums are the biggest culprits. The drums seem too perfect and mixed too high. The rest of the instruments are fairly mid-ranged to high as well, so the whole thing ends up kind of tinny. The vocals are too grandiose all the time and sound so separated from the rest of the musick. In general terms, I want to hear the room, not the band, if that makes sense. If you focus too much on the band, it strains my ears; everything just exists in a vacuum. It's not grounded; it just is. It seems to lack a meaning, floating in a plastic coating through a whole in space that isn't space but just a single color like the pink of the cover here, a true Sonic Sea that someone is lost in. If the album had more life to it, less polished production to the point where that polish pierces my eardrums a bit, along with more variation in song structure and vocal performance, it would be a Good album. As it stands, Sonic Sea gets a Neutral.